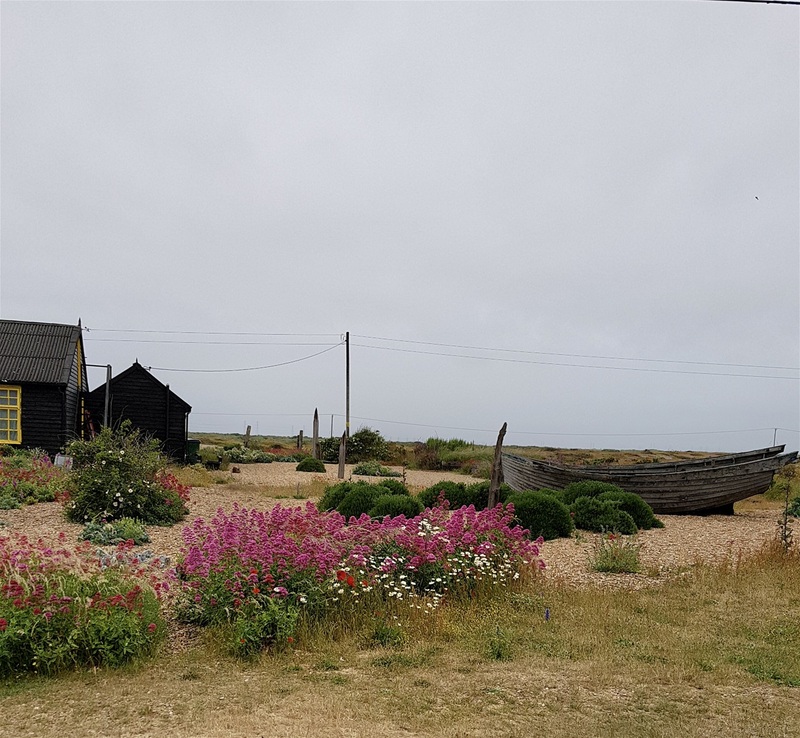 Dungeness, Damp, Dismal, Desolate, Dreary. Such a friend to alliteration. But Marigold loves it. 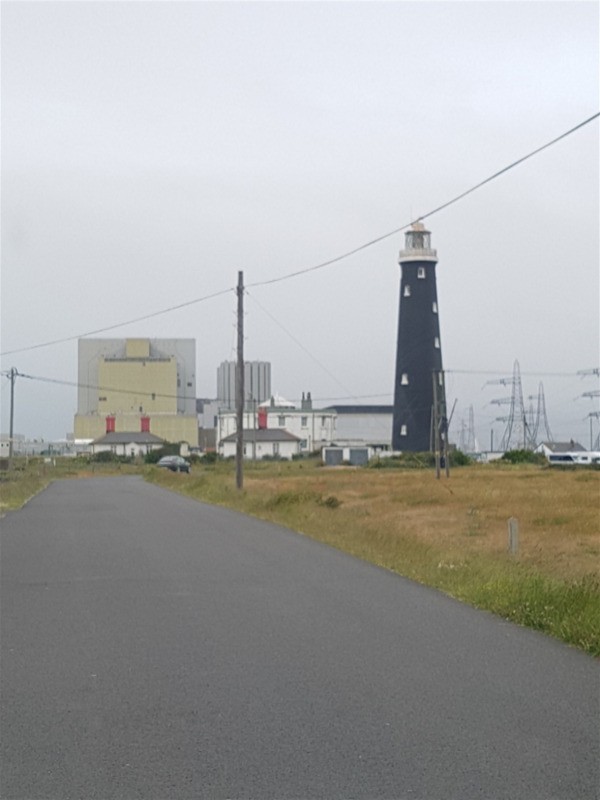 We set off for Dungeness which we have been to before, and usually when we visit it is either foggy or raining. The weather didn’t disappoint. The sea fog had come in, so everything looked eerie. It is like something out of Mad Max, with shed houses, some good, some bad. You can tell the ones which scream “I want to buy a shed house for an arm and a leg, extend it and buy shabby chic furniture, get bored and then sell it”. 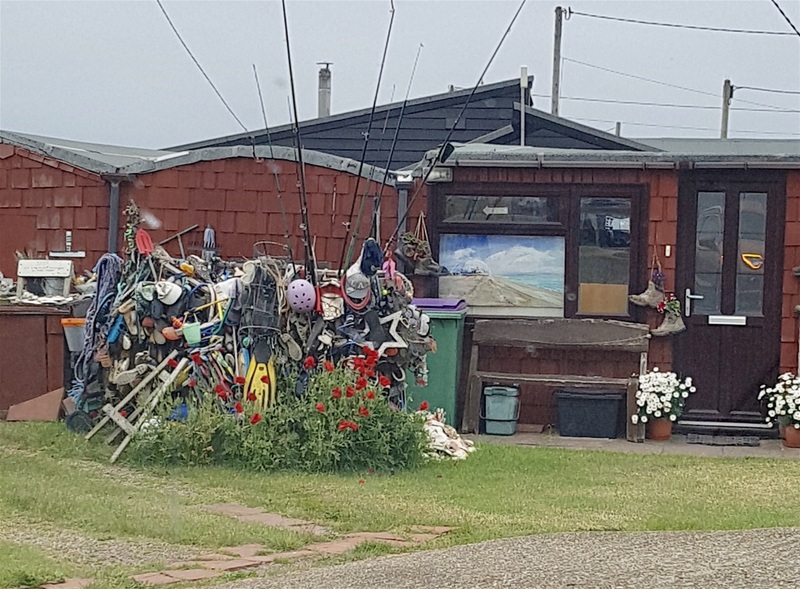 You can also tell the old stagers who dress up like fishermen and collect stuff off the beach and decorate their shed houses with it. The back drop for most of the inhabitants/nutters is the Nuclear Power Station. I just love it here. You can imagine them filming The Walking Dead, and maybe they have. Apparently there are flowers and plants there, that are very unusual. Maybe it is the overflow from the power station that they water them with. I think I read something about an orchid found locally and its rarity. Only place in the world it grows. Better put back the one I just dug up then! 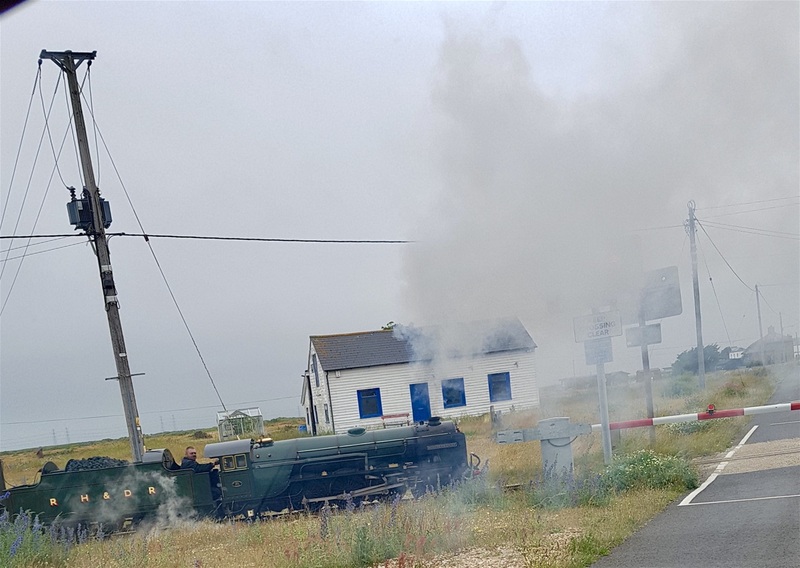 What was really weird was watching the little steam train coming through the mist, full of holiday makers. All four of them. I said to G maybe it will drive into the power station and come out empty, and they will never be seen again. G ignored my imagination and carried on chuntering about the price of kit-kat (dark chocolate) in the petrol station . I like the milk ones. Talking of kit-kat, they are not the same without the silver paper. Enough confectionary related grumbling. 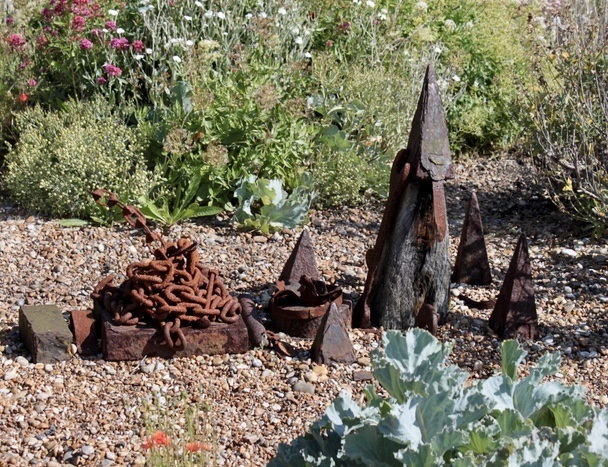 We visited Derek Jarman’s garden, a lovely little wild fest. It is like a shrine to the great man, if indeed he was. Don’t know much about him, but G does and will fill you in. We had to leave all in a rush as a klaxon sounded and men in white suits rushed around. Well, it could have happened. Went off in search of Bovril to warm the cockles. 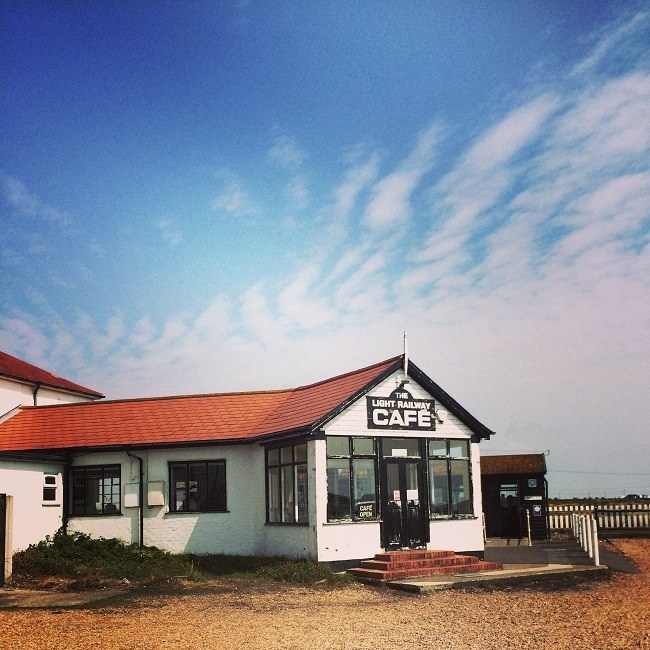 As we left Dungeness the sun came out. 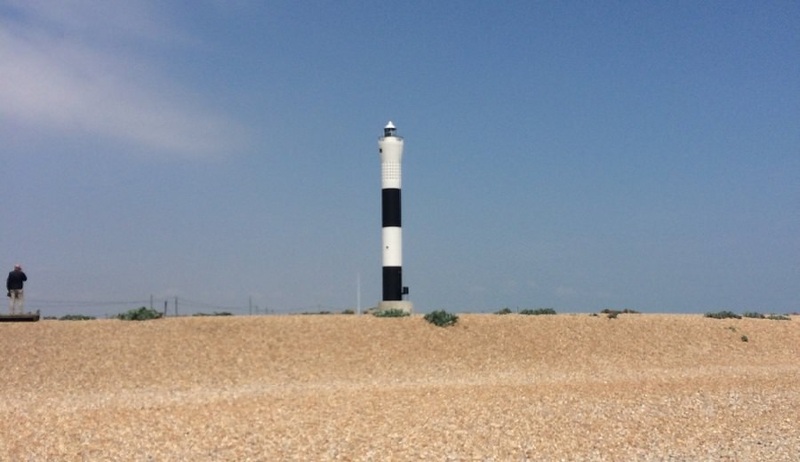 Dungeness. Marigold loves its wildness, its unworldly aspect. 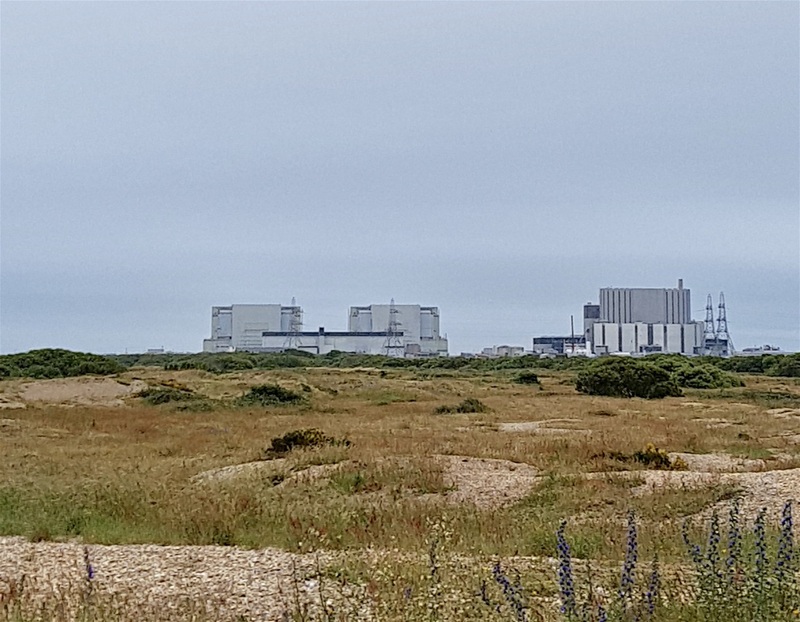 I just think it’s a scruffy patch of unusable land with a shingle ‘beach’ bordered by a grey sea one one side and Romney Marsh on the other, blighted by a dirty great, incredibly unattractive nuclear power station. We agree to differ, but today the clouds are grey, there’s rain in the air and in fact it’s exactly what I call ‘Dungeness weather’. Marigold isn’t daunted, of course. We approach from a different direction than our usual route, not that it’s any more attractive. 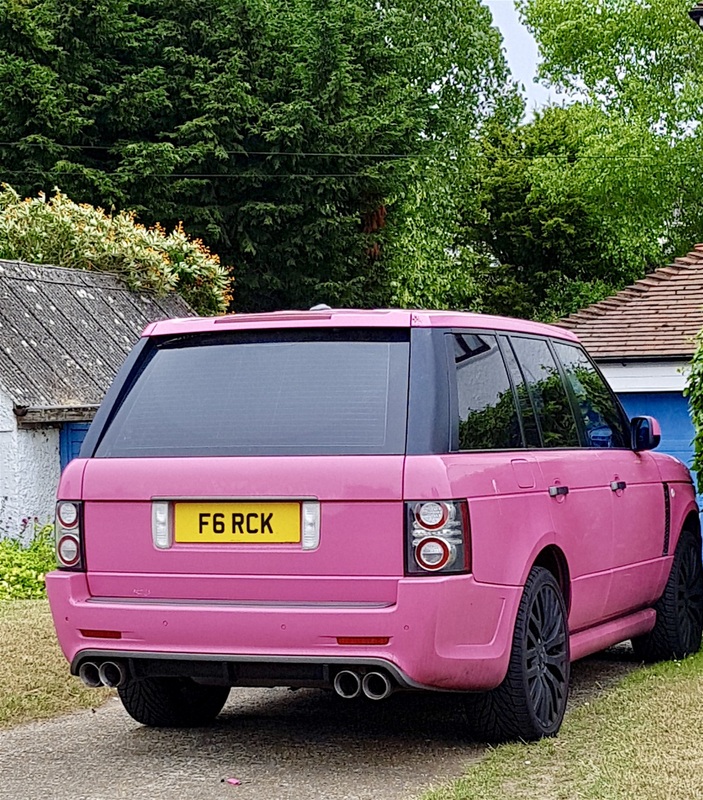 There’s a bright pink Range Rover in someone’s drive which we like, but don’t covet, and a fair few big houses which must have been even more impressive in their heyday. We drive the coast road and are soon rewarded with our first glimpse of the power station, looming out of the mist. It’s as hideous as ever. To be precise there are actually two power stations: a working one and its predecessor now decommissioned, but still a liability for the next hundred thousand years or so. There are two lighthouses as well. Show offs! 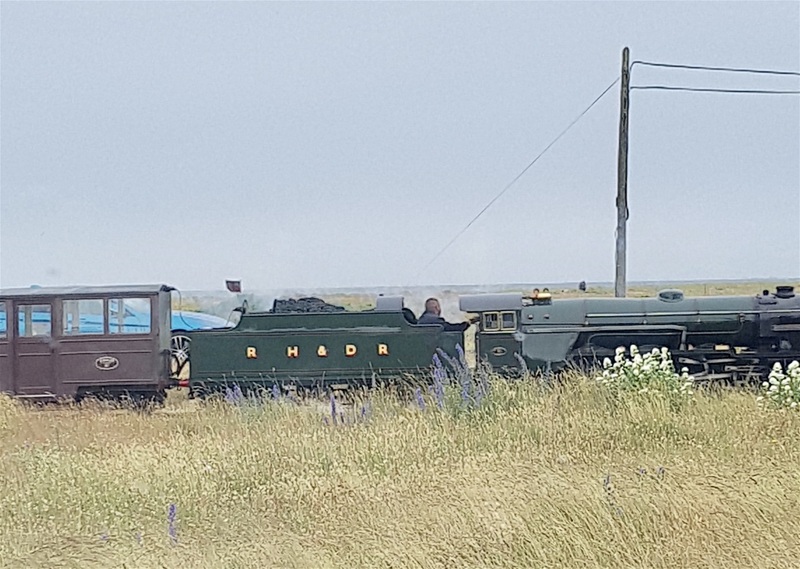 We’d just entered the scruffiest bit when we saw the little train approaching, parked up and went to get a closer look. It’s travelled from Hythe, picking up passengers up along the way, there were four of them by now! In fairness, in better weather and in the school holidays, we have seen it packed with passengers. A fellow train watcher, obviously a local resident as he greeted the train driver by name, decided we were in need of instruction and found an audience in Marigold. He had two visible teeth, one at the top, one at the bottom, which was a bit of a distraction as he talked. 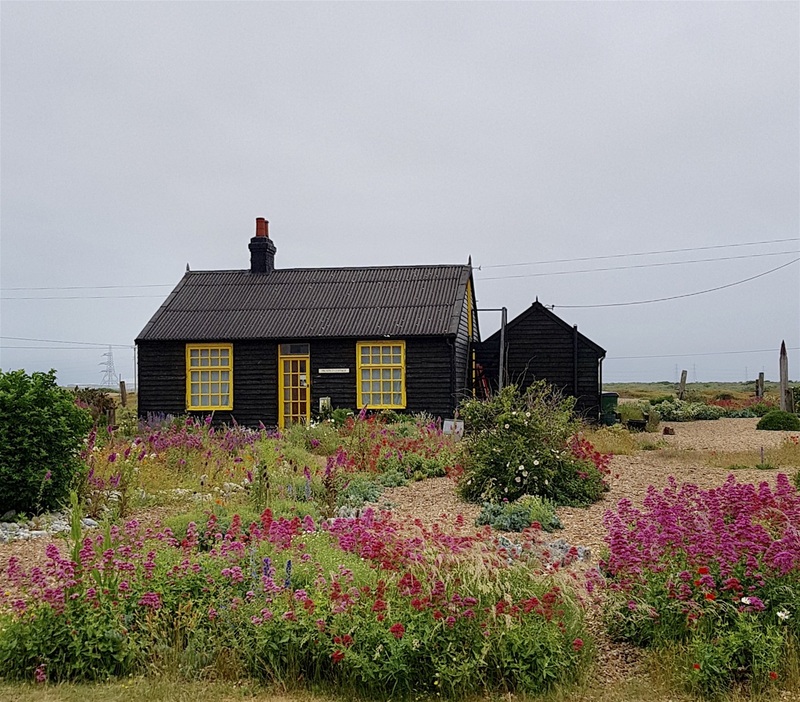 The Dungeness Estate, which we’d just entered covers over 6,000 acres and it’s the only place in the UK which has been officially classified as a desert. Marigold was obviously entranced by her new companion. I suspect she just wanted to watch those teeth waggling up and down as he answered her questions. 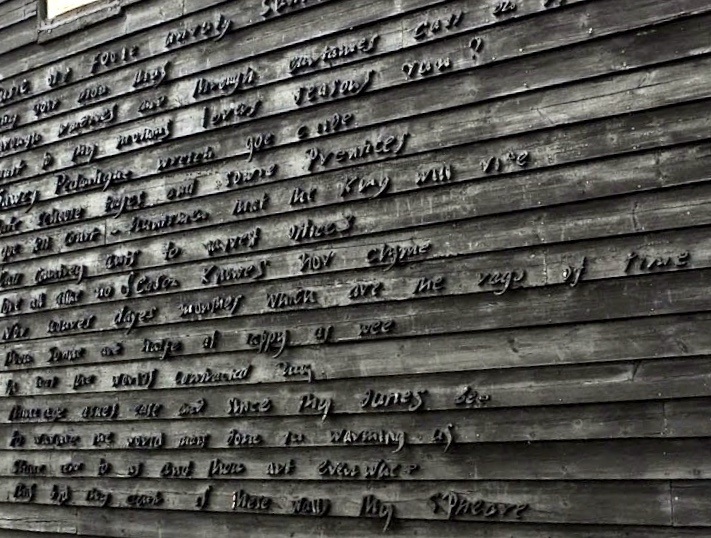 The ‘house’ in question was a shack, constructed of corrugated iron sheets. We’ve seen refugee camps in Africa with better accommodation. There were three other houses in the vicinity, all equally shoddy: timber ‘sheds,’ old railway carriages and all adding to the general air of desolation. If this is a desert, it’s the scruffiest one we’ve ever encountered. The landscape has a ‘lunar’ quality, flat, bare apart from a few patches of scrub and looming out of the mist are a pair of nuclear power stations. Does Chernobyl look like this, I mused. Crowds? We were the only three people in sight, but I know what he meant. We’ve lived in areas frequented by tourists and the winter months are when we get our ‘home’ to ourselves. It’s pretty bleak here though, even in June. In January it must be really grim. Gulp! We both mentally crossed locally caught fish off the lunch menu. Nuclear power is supposedly efficient and does far less harm to the environment, in the short term at least, but even so, would we choose to eat fish caught within its shadow? Marigold still needed to know more about the pleasures of living here. He wandered off, still without asking Marigold if she’d like to come and partake of a cup of tea in his kitchen. 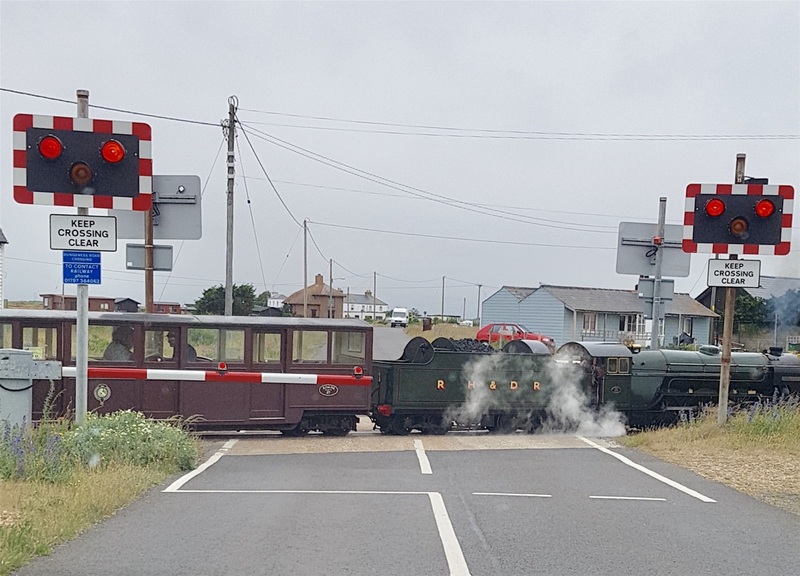 We returned to our car, drove to the end of the railway line, right next to the power station, where there’s a café, but as we were about to go inside for a drink, Marigold spotted a medium sized van and decided we should follow it as it was obviously a removal van. We followed the van, not a removal van, just a van, but soon saw the ‘real’ removal van outside a shack, not really a house, with actual furniture removing taking place. 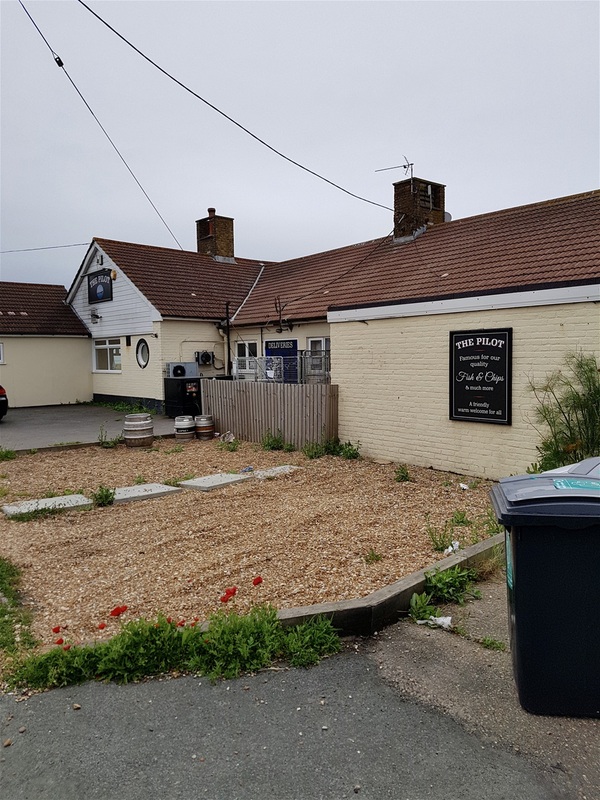 I looked for ‘Sleepers Cottage’ on the web. It is indeed on the market for £275,000. It’s a converted railway carriage, rather charming actually within its obvious limitations, but I’ll not be following up this opportunity. 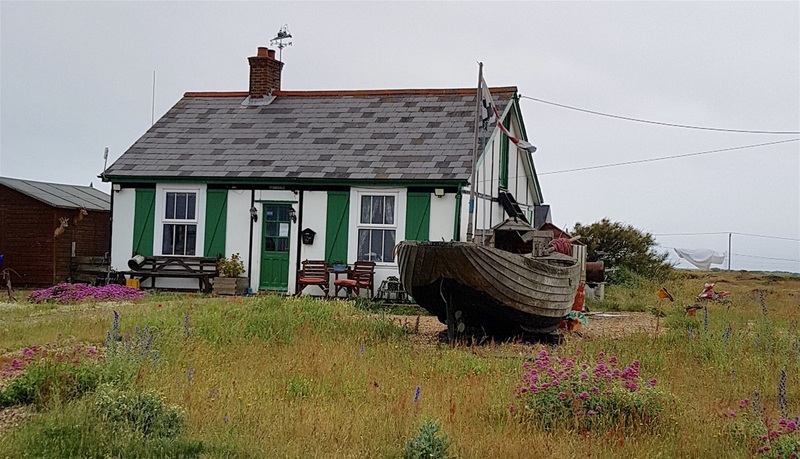 Originally the home to several well established fishing families, today Dungeness resembles the shanty towns we’ve seen in the Nevada desert. It’s become ‘trendy’ over the past decade or so; its out of the way simplicity an obvious attraction for those weary of the rat race. Assuming they have the financial resources to live here, of course. 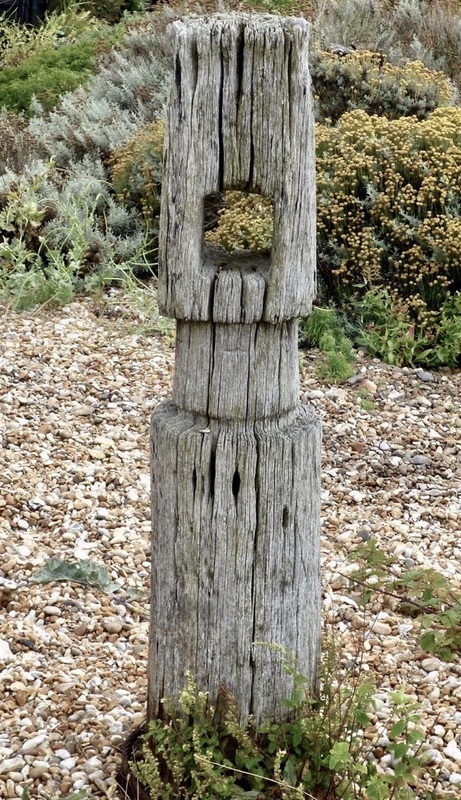 Many of the shacks purport to be art galleries, often with sculptures composed of driftwood and articles scavenged from the shore outside and there’s an extensive nature reserve, still in the shadow of the power station, in the surrounding area. 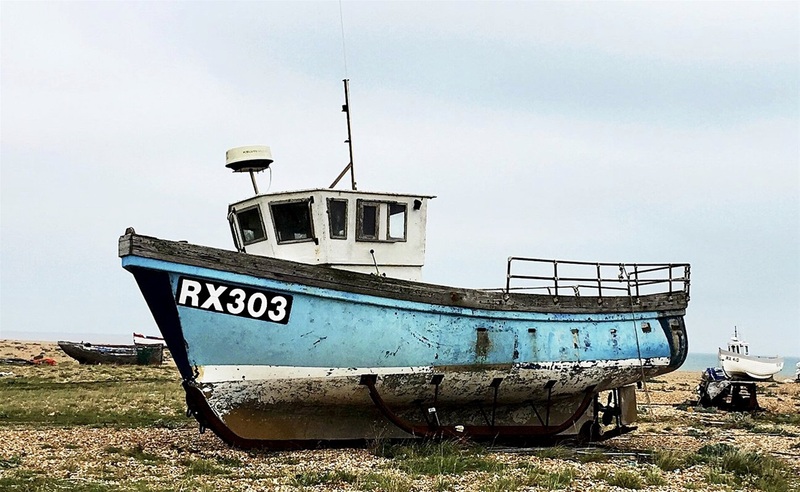 I found myself liking the unreconstructed nature of the shingle beach with an occasional beached fishing boat lying askew and apparently abandoned. I also like the absolute randomness of the tin shacks, faded wooden sheds and former railway rolling stock that constitute home to those hardy souls that live here year round. The serenity, the nonconformity, the proximity to the sea, I can relate to that. I could even live here. If only there weren’t a vast and hideous nuclear power station in the back garden! The phrase ‘blot on the landscape’ has never appeared so appropriate. 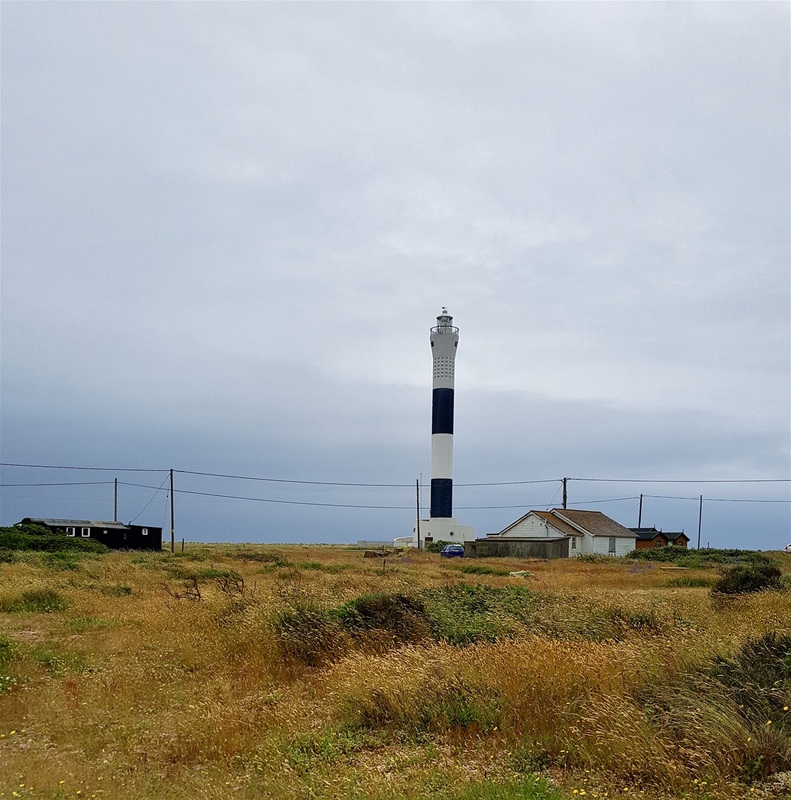 Not that Dungeness would ever have the effrontery to regard itself as pretty. Not even attractive, but even a windswept landscape such as this deserves a better neighbour. 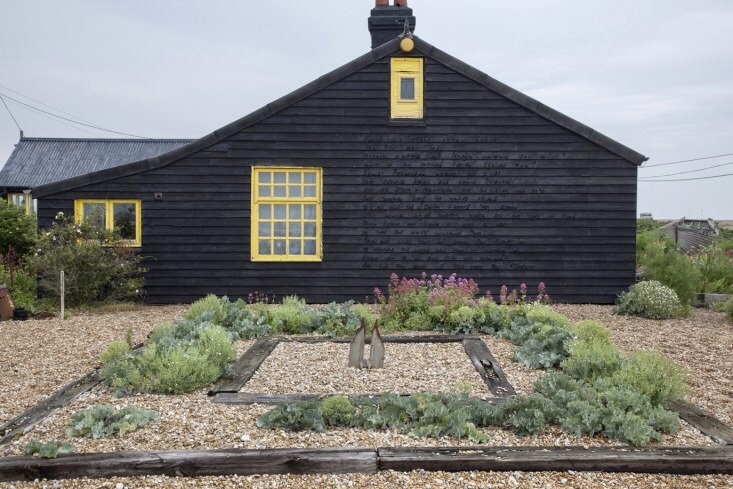 We went to look at Derek Jarman’s house, Prospect Cottage, which we’ve been to view several times before. 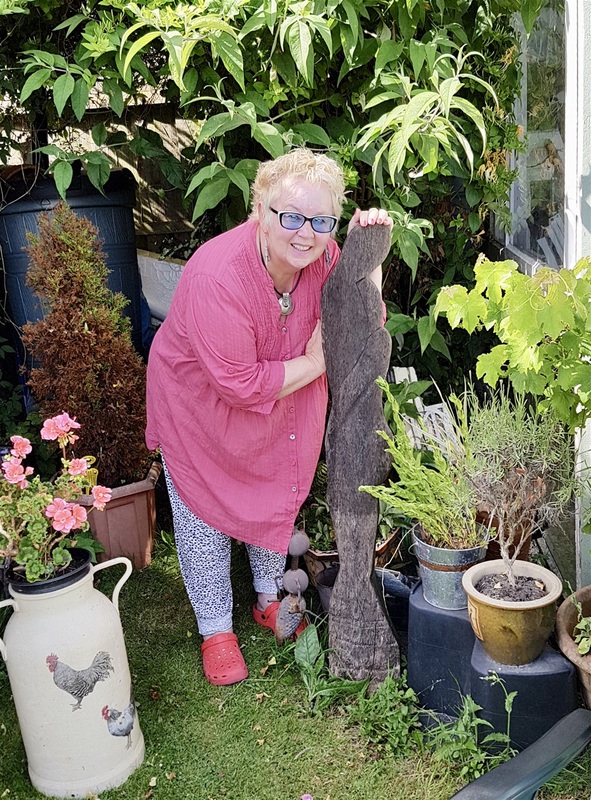 The former film maker bought the house many years ago and set about the task of making a garden from the scrubland that surrounded the cottage. The result is quite charming and Prospect Cottage receives many visitors who stand and admire the simplicity of his creation. Hmm! Sounds like The Guardian. 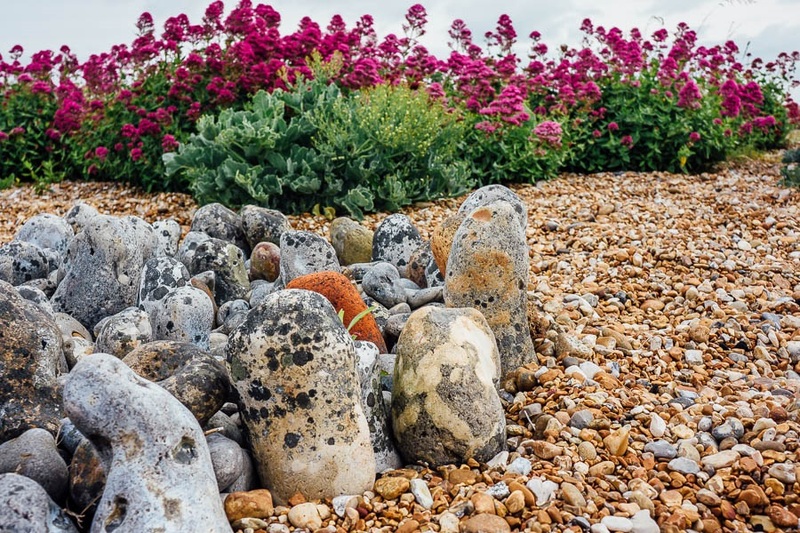 I like the scattered artefacts, the small circles of flint possibly intended as tiny versions of ancient dolmens or standing stones and the absolute and obviously intentional absence of pretension. 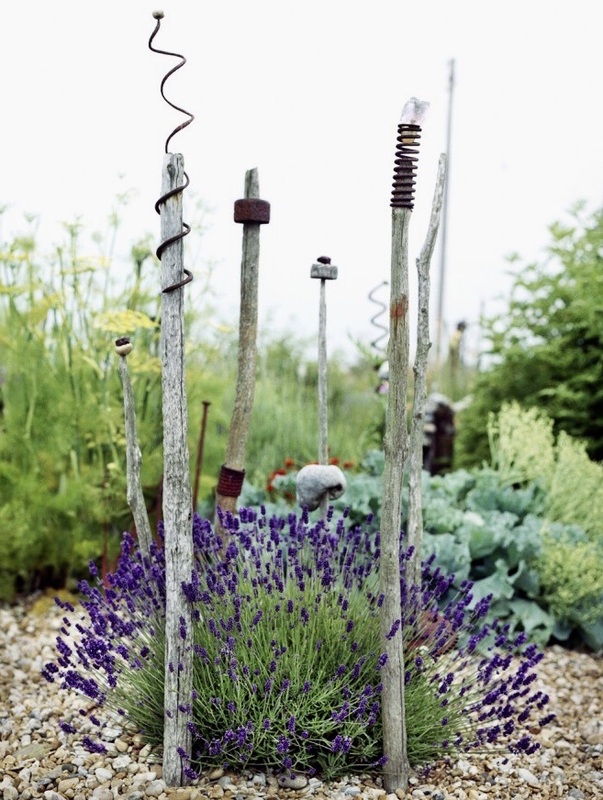 I looked up a half remembered quote of Jarman, in relation to his garden. 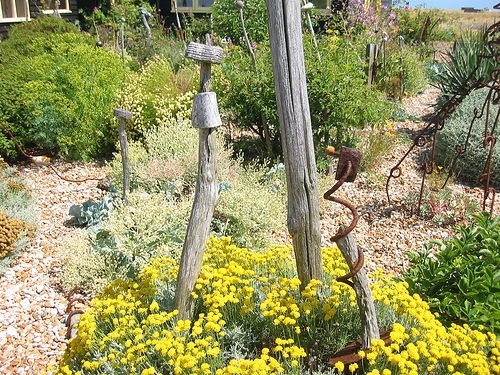 Derek Jarman died in 1994, but his former partner continues to spend time here and maintains the garden. 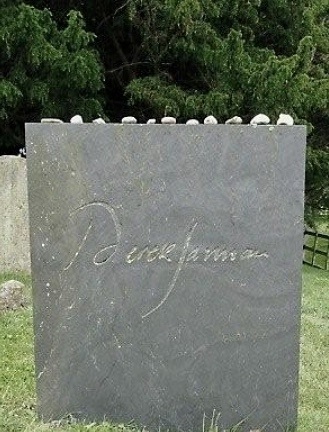 Jarman was a confirmed and voluble atheist, but is nevertheless buried in the nearby graveyard at St. Clements Church in Old Romney. We found the graveyard, quite easily. Finding the actual grave was somewhat more difficult but we managed it. It’s a minimalist headstone; even an atheist buried in a churchyard would have approved of that. Two power stations in your back garden? One of the pretty houses. There are a few. 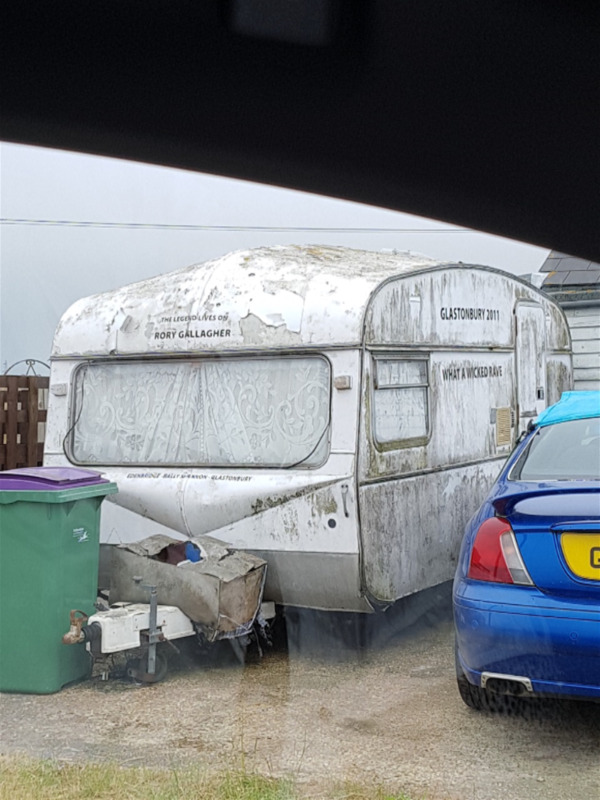 Seen better days, yes, but could tell a few tales! As close I could get without intruding on the owner’s privacy. Minimalism, at its finest. Enough to make even an atheist buried in a churchyard happy.